For those of you coming from the land of 10g, you get to add yet another piece of information to the scrap heap that is “obsolete technical stuff I know.” Specifically, how to modify the menu structure in WebCenter Content has been changed in 11g. All of those NavBuilder tricks you know can rest in peace alongside your Perl and REXX programming skills. In this article I will cover how the new navigation model works in much more depth than is currently available in documentation or on the web. In general, the way navigation works now is that you add a few files to a component which contain menu information then enable the component. The files make use of the new Data Include capabilities in 11g to append your menu entries to the default menu entries that are delivered with the system. For this example we’ll add a new component, but if you already have a custom component that is used in your business, you can certainly skip this step and just add the menu resources to your existing component. On the next screen we will fill in the name of the new component, leave the other fields at the default and then click OK.
Once the component is created, we can begin adding the menu resources. The first resource we’ll add is CoreMenuItems. We will choose an HTML include/String resource as the type of resource definition. On the next screen check the Data Include box. This will change to the Data Include screen, which should look something like the one shown below. If the default text doesn’t appear, don’t worry. We have to replace it all anyway. CoreMenuItems is one of two resources you will most likely use to modify navigation. It contains a list of menu items. These are merely definitions of a menu item and aren’t meant to show where in the menu structure a menu item may exist. If you are only rearranging the existing menu structure you won’t need this file, but assuming you want to add a menu item this file is necessary. When creating these files keep in mind that the values in your file will load last and if you have the same name as one of the system values, your menu item will override the system value (discussed shortly). For now, let’s create a few menu items so we can show some of the flexibility of this new navigation model. Below is a screen shot of a sample menu item resource. Let’s look at it in close detail. Name: this must be CoreMenuItems and the case must match exactly. Remember you’re appending to a resource that’s already out there. ID – A unique identifier for your menu item. 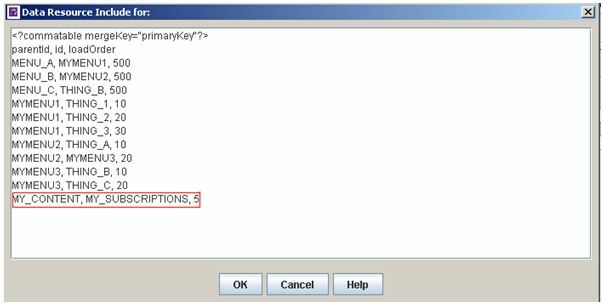 This ID is used throughout the other files to refer to this specific menu item definition. LINKTYPE – There are six pre-defined link types, however if needed, you can create your own link types by modifying std_compute_menu_link or navigation_modify_rset_menu_items. WEB – This is used when accessing the web viewable data on the content server and begins after the http web root which in most cases begins after myserver:16200/cs/ in the URL. ADMIN – this is like CGI in that it executes a service using an http CGI path except it is used to execute services on the admin server using that servers CGI path. Enterprise – I haven’t tested this, but according to the documentation it is similar to CGI and ADMIN and appears to only be used when there are proxied servers and you wish to execute a service from the http enterprise CGI path. External – this is used to access external websites. LINKDATA – This is the data that corresponds to the link type. CGI – the IdcService call to execute. WEB – the path to the resource on the content server. ADMIN – the IdcService call to execute. Enterprise – the IdcService call to execute. External – the website address. You must include the http:// in the address. The next three lines (MYMENU_1, MYMENU_2, MYMENU_3) define menu heading items that have no actions. These will simply be menu headings that are used to display a sub-menu. Notice that there’s no LinkType or LinkData. Finally the last six lines are menu action items that will perform various tasks. There are examples of each type of link except Enterprise. Notice also that THING_2 is a search and we include an Idoc Script reference to <$UserName$>. Idoc Script can be used throughout the menus. The CoreMenuItemRelationships describes the relationship of menu items within the content server. The sample below shows how the menus above were created. Let’s take a closer look at this information. 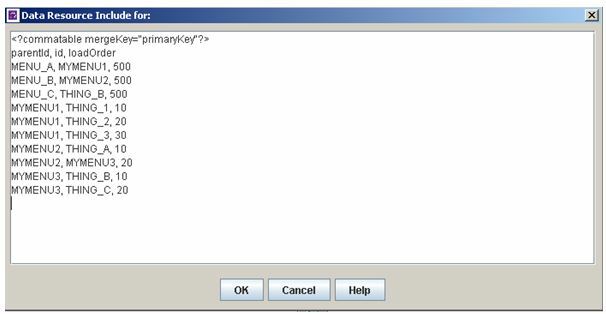 The <?commatable mergeKey=”primaryKey”?> line is very important and required to make the information merge correctly to the system default menu information. The parentid, id and loadOrder specify the ID of the parent menu item and the child menu item as they are defined in the CoreMenuItems. The load order determines the location on the menu. As you can see, we add MYMENU1 to MENU_A which results in the My First Menu being added to the MENU_A navigation bar. A load order of 500 is used to ensure that the entry shows up at the end. Shown farther down you can see that the same menu item can be used on multiple menus. The final menus look like this. It’s important to know that MENU_C is different than the other two menus in that it will only display a single item. It is intended for invoking action on the content server, rather than displaying a menu. If a menu item with no LinkType and LinkData (like MYMENU1) is attached to MENU_C, any corresponding menu items won’t be displayed. The final step is to enable the component and restart your content server. If your menus don’t work as expected or the content server fails to start, there is most likely a typo in one of the files. Override Default Menus – The key to overriding the default menus is to first find where they are. The menus are in the std_nav.idoc which is located in the \ucm\idc\resources\core\idoc folder within the WebCenter Content server instance. Searching for CoreMenuItems and CoreMenuItemRelationships within this file will provide information about how the menus are constructed. 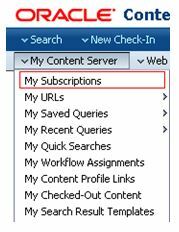 In our example we’re going to move My Subscriptions from the default location to the top of the My Content Server menu. Searching the std_nav.idoc, we find the following line defines the MY_SUBSCRIPTTIONS menu item. And we further notice that the first entry in the MY_CONTENT menu has a load order of 10. 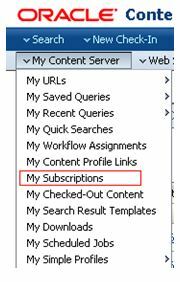 To move MY_SUBSCRIPTIONS so it’s first in the menu we simply override the load order by adding the entry to our custom component as shown below. The result of adding that line is that the My Subscriptions item will be moved to the top of the menu. In the new menu model, adding basic security and performing some systematic checks is fairly easy. In our example, we may want to have one of the menus with administrative options only show up for system administrators. As we’ve done before, we return to our component and add another include. This time we add a CoreMenuItemsFlags include as shown below. This is fairly straight forward. Supply a menu item ID and then assign some flags. The flags are separated by a colon. As shown above, MYMENU1 is disabled for everyone other than administrators and is not visible when not logged in. If you’re like me this makes you ask two questions: where are the flags defined and what happens if I need to add security that isn’t provided by these flags? isTopMenusOnly: Menu item is only shown in the Top Menus layout. isTraysOnly: Menu item is only shown in the Trays layout. isLoggedIn: Menu item is only shown to users who are logged in. isAnonymous: Menu item is only shown to users who are not logged in. isAllowIntranetUsers: Menu item is only shown if <$isAllowIntranetUsers$> is true. isSelfRegistration: Menu item is only shown if self-registration is enabled. isProxiedServer: Menu item is only shown if <$#env.IsProxiedServer$> is true. isContributor: Menu item is only shown if user is a contributor. isAdminAtLeastOneGroup: Menu item is only shown if user is an admin of one or more groups. 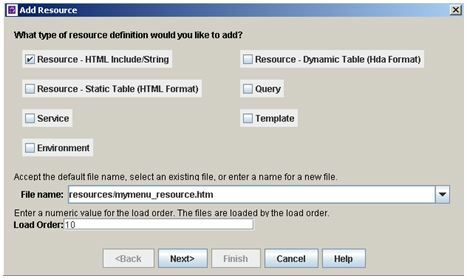 isSubAdminOrSysManager: Menu item is only shown if the user is a subadmin or sysmanager. 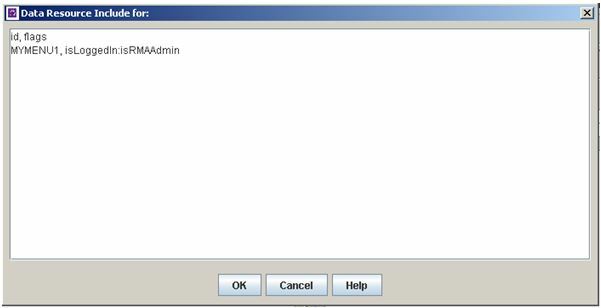 isAdmin: Menu item is only shown if the user is an administrator. isSubAdmin: Menu item is only shown if the user is a subadmin. isSysManager: Menu item is only shown if the user is a sysmanager. isContentRefineryPresent: Menu item is only shown if there is a content refinery present. isDynamicConverterEnabled: Menu item is only shown if dynamic converter is enabled. 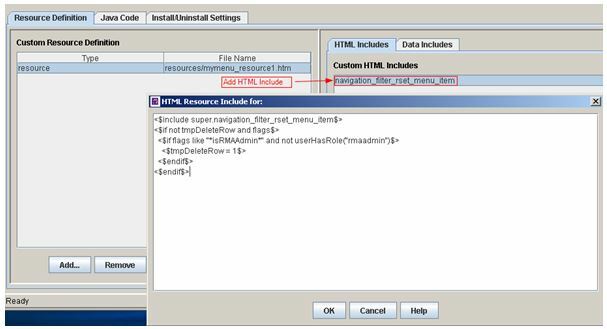 isJspServerEnabled: Menu item is only shown if JSP server is enabled. hasIndexAdminActions: Menu item is only shown if there are index admin actions. hasCollaboration: Menu item is only shown if collaboration is enabled. hasDownloadBundle: Menu item is only shown if bundles are available for download. isGroup: Menu item is a group. This means that the item itself is not visible but any items with this item as the parent will be grouped together. targetTop: Sets this menu item’s target as “_top”. targetBlank: Sets this menu item’s target as “_blank”. isIdcTokenRequired: Menu item calls a non-scriptable service and thus needs to provide the idcToken. The second question is answered below. The question often comes up of what to do about the menu items that aren’t covered by the default security flags above. For example, a very common request is to constrain a menu or option to only those folks who have a specific role. There are two ways to do this. The first is a bit of a hack, but I’m not too proud to tell you about it. It’s not the “best” way to do the job but it will work in a pinch. For those who are seeking a more elegant solution, the best option is to add your own flags to the CoreMenuItemsFlags include. The first step to adding your own flag is to add an entry to the flags CoreMenuItemsFlags include and type in whatever you want for a flag name. For example if you are using records management you may want to make a flag called isRMAAdmin and use that to limit certain menu items to those folks who have rmaadmin roles. In our case we’re going to add the flag to MYMENU1 as shown below. In cases where you need to do a logical OR you will need to create a flag that performs the OR logic like Oracle did with isSubAdminOrSysManager. As you’ve probably guessed, there aren’t magic elves that interpret your newly created flag and just make it work behind the scenes. 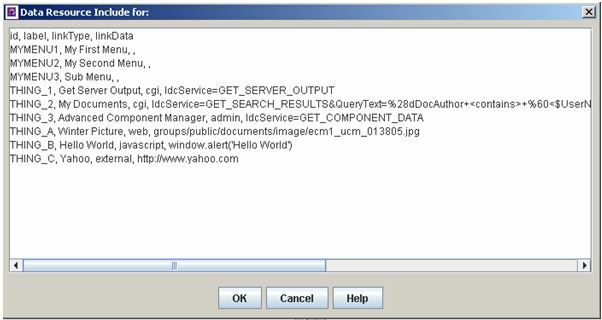 You will have to extend the base functionality of the content server by extending the navigation_filter_rset_menu_item include as shown below. NOTE: this is the same resource that you can override to create custom link types, but we won’t go into that here. The first line of the code includes the existing version of the navigation_filter_rset_menu_item include. 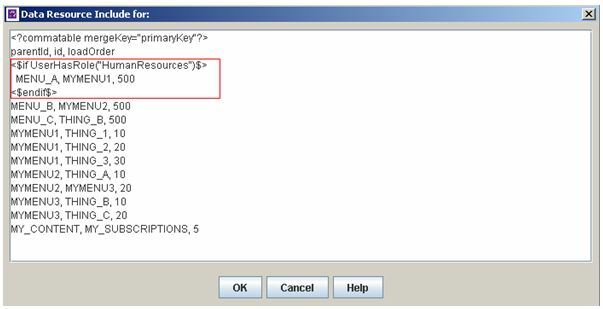 The next lines check to see if the flag matches isRMAAdmin and the user does NOT have a role of rmaadmin. If those conditions are met, the row is deleted from the menu. This effectively removes the menu. Obviously any Idoc Script can be used here to determine whether a menu row should be deleted, so you have tremendous flexibility. We covered much of what the menu system has to offer, but there is more. Everything that has been covered above is included in the MyMenu sample component that is available with this blog. 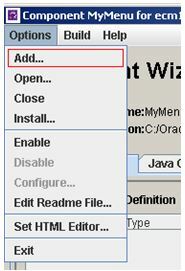 Perhaps the best additional resource for exploring the WebCenter menu system capabilities is through a sample component available from Oracle. 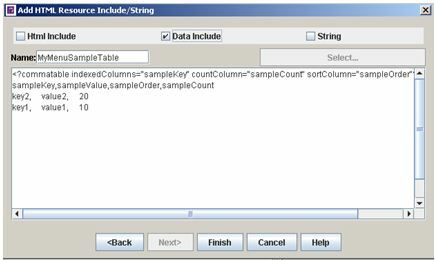 The MenuExample.zip component is available for download here: http://www.oracle.com/technetwork/indexes/samplecode/webcenter-content-samples-1352729.html and it contains documentation and samples in addition to those we’ve provided. Between the sample component included with this blog and the Oracle example you should have much of what you need to make excellent use of the flexible new WebCenter navigation model. For more customization help with your WebCenter implementation, contact us today! This entry was posted on Tuesday, November 19th, 2013 at 10:23 am and is filed under ecm, Oracle, WebCenter Content. You can follow any responses to this entry through the RSS 2.0 feed. You can leave a response, or trackback from your own site. Thanks for the additional information Jon!